HID VertX EVO™ V2000 is a two-reader access control panel that enables with two doors (single reader) or one door (in/out reading). The EVO V2000 handles all online door decisions, door input monitoring and output control and reader interface for upt to two doors. The solution has two inputs per door for door monitor and REX, and two outputs per door for lock and AUX. VertX EVO V2000 also includes three inputs for AC Power fail, Battery power fail and Tamper, and is powered by local power supply (12 or 24VDC). 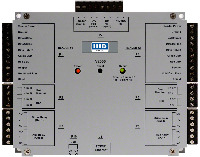 Interface for two Wiegand or Clock-and-Data readers; inputs for 2 doors monitors, 2 REX switches, AC fail, Battery fail and Tamper.